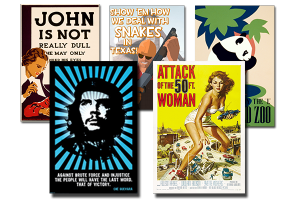 Printed posters are a direct visual experience for most people. This is one form of advertising that always gets noticed. The artistic designs for posters vary widely, and most companies use their own logo somewhere on the poster. With all the different types of visual art that make up the posters, it is usually given to the buyer or client to decide on their poster design. one of these courses will enhance your skill and knowledge. The designers usually prefer a digital file to work with before the printing stage. There is an infinite range of designs for posters; for instance; contemporary, vintage from any era, artistic, photographic, only calligraphy, and many more, it is really the choice of the client that determines the design and type of poster to be printed. Digital printing for posters will usually work with most colours and shades that are found with a printer. With most computers the colours are RGB and this is a little different in the real world of colour print and the range of colour shades available on a printer. RGB has more colours and shades than CMYK (used in printers), and some colours, when printed, can appear dull. Allowances need to be made regarding the exact colours and shades when RGB colours are used with CMYK printers. The company you choose to print your poster should be able to allow for this. Of course, you might want your poster to remain as a digital poster for digital advertising and social media, or you may want both. The RGB colours will stay truer to your design in the digital form. Whether your digital designs will be animated or static, the places for advertising digital posters is as wide a range as the designs themselves. Some of the places to use a digital poster, for example, would be as a banner for social media pages, advertising in news media or TV. Taking photographs and selfies including the printed posters are another way to send out a visual advertisement on the internet. To have some idea of the sizing of a poster when choosing printing is helpful to the company or the printer. They will need to know where the poster will be displayed to have some idea of the generic size for the poster. Will this be used commercially or privately? Will this poster be a paper printed poster or a digital banner? As a business owner, you may want this to show prominently at your business premises, or if it’s a private poster, you may want the poster on your living room wall. Printing paper for posters is usually A2, A3, or A4 sizes, using a heavy-grade paper. The size of digital print varies as well, and this also depends on how many pixels are used with a digital print to give a clear picture for the size required. With digital banners the size will be usually determined by where and on what media this will be displayed. A good printing company will know the best size and layout for your poster requirements.